There was a time when simply creating content would set your business apart. It was new, unique, and interesting. These days however, content creation has not only become commonplace, but a standard component of marketing strategy. How then do you help your business stand out from the competition? The answer certainly isn’t to stop creating content! According to Garrett Moon of CoSchedule, the answer is to find your open space to create what he calls “competition-free content”. The idea of competition-free content is this: your business itself provides value, therefore you should be able to find a space where your business uniquely reaches your audience and provide content in that realm. By identifying your “blue ocean” and choosing the right projects to focus on, you can set yourself apart from the competition and provide real value to your customers, and ultimately to you. Where is the best skiing that you’ve done in the last two years? Garrett and his family have an annual trip to Big Sky in Montana so hands down that’s his favorite place to ski! What kind of skiing do you do? Ever since childhood Garrett has been a big fan of Super G. Whether it’s icy or powdery, he just loves to go fast! What was your post-ski drink of choice at the lodge? Cold beer with some pistachios on the side! Randy Frisch: Hey everyone, I'm Randy Frisch. Anna Hrach is with me. This is the Conex Show and really excited about today. Now, those who were kind of skimming across the different podcast that we've got and picking this one may have said, "I've seen someone from CoSchedule on before this." We did have Garrett Moon who is our guest today. We had his co-founder news from CoSchedule almost a year ago probably. He talked a lot about how you plan the content you put out there, a lot of the principles that come from the business CoSchedule that they have to help marketers, but today was kind of cool because it was the culmination of all their best marketing practices to do what they call 10X marketing. I love this thing. I'm sure you did too, because I think too often we get stuck in this mentality that we just have to create content to keep up with the competition but ultimately maybe that's what's pulling us down. Anna Hrach: Oh yeah. Honestly, this is one of my favorite topics to talk about in general is just it's a lot of what Garrett talks about in his books. So, his book is actually the 10x marketing formula. So, even though he's a CEO and co-founder of CoSchedule as you mentioned, this book is amazing. It actually is available on Amazon for presell right now that comes out on March 27. So, the day after this airs it's going to be available everywhere. He talks a lot about those content traps and I'm really, really passionate about them especially he touches on the traffic trap where a lot of marketers think that just because traffic is coming to their site because of content. That it's amazing and it must be performing when in reality it could just be a ton of unqualified traffic. He also even talks about parallel content traps in the book and just how it gets away from your content core. It honestly to me spoke to everything I love and everything that I preach and everything that we do at Convince. It's an amazing book. I don’t even want to give away the whole episode, but Randy what did you think? I'm going off on a total tangent now. Randy Frisch: No, I agree with you. A lot of the stuff you just hit on that Garrett went into is kind of like broadening the definition if you will of like the entity metrics which I feel like the entity metrics has become a vanity term because we don't even know why they're a entity metric but he actually goes and to explain to us what we do want to achieve, how we do want to connect with people. The cool part to me of that ways giving that formula if you will to steal from his headline of how we find that core content. I think that's the really interesting part which is, how do we pick that content that people are going to resonate with? We've had other guests on this podcast before like Jason Miller who's talked about the big rock of content, but I think this is more funny the sweet spot in general, because it's not just about one piece always. It's about what are the things that we're going to do that going to continue to hit on the problems that we're trying to address for customers. I think for a lot of us as we think about the right content experience put in front of people, it really does start with connecting with their day-to-day problems. Anna Hrach: Yeah. There's so much great information in the book. Garrett goes into it on the podcast as well. He really starts to talk about the whole reason behind 10x is the things that will bring you 10x return versus 10% return and really figuring out where to spend your time and what to spend your time on. From my perspective, this is a book that if you're doing content marketing, it's an incredibly valuable asset. If you're just getting into and you're trying to figure it out, it's an incredibly valuable asset. If you're trying to get other people at your organization to understand strategy, it's an incredibly valuable asset. It's a fantastic just how to … it's great. It's funny. I was a huge fan. Randy Frisch: I think Anna has maybe got some sort of kickback on this book happening because she's been a … I know you don’t. I know you're a fan. Anyways, you listen to this podcast, you'll understand exactly what Anna is talking about. If you listen to the very end, you'll find out why Anna hates winter. So, you got to listen all the way to the end and we'll get there, but for now, let's roll right in with Garrett Moon. Anna Hrach: Garrett, thank you so much for being here with us today. We are so excited to talk to you about especially your new book 10x Marketing Formula. Would you mind just giving everybody just a little intro about you? Garrett Moon: Yeah, absolutely. Thanks Anna. Thanks for having me on and it's good to be on with you and Randy. You know I think there's so many things as a startup founder that you get labeled as, but I'm the CEO and co-founder at CoSchedule. I've headed up our marketing and sales team for many years now and helped build our team. At CoSchedule we are is a marketing tool. We help marketing teams get organized. We give the place to schedule their content and social in one place and then we provide a ton of workflow tools. So, task management, communication, optimization so that marketers aren't having to jump between spreadsheets and Slack and email and then their calendaring tools and social scheduling tools. So, we really try to take that that messy marketing workflow, make it really simple, put it on a calendar make it a place for the whole team can execute and do those things together. Yeah, that's what we do every day. So, we have the fun privilege of getting to talk to marketers all the time and really hearing what's going well in the industry, what's kind of gone rough, where do they need help and we've used it to improve the product, but also just to really sharpen our thinking in terms of how we approach marketing, how do we solve some of the bigger problems that are out there on a regular basis. That's really where the 10x Marketing Formula came from and really a lot of the work that we do each day. 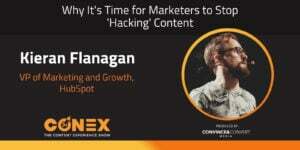 Anna Hrach: So, I was reading through my advanced copy of 10x Marketing Formula, I can absolutely see all of that experience that you just talked about in the book and especially as someone who actively creates content strategy and content marketing strategies for clients every day, it is absolutely 100% clear that everything you've taken and learned from your experience of brands has come through in the book. It is filled with amazing insights. What were some of the reasons that got you started on this path to writing the book in the first place? Was it just your experience with those brands and seeing them struggle? Tell us a little bit about that. Garrett Moon: Yeah. I think that's a really good question. To tell the story, when we launched CoSchedule, we actually, me and my co-founder, ran an agency. So, we did web development, marketing, consulting and some software development as well. So, we had a lot of the core skills to build marketing software, but the thing that really drove us to it was the problems. This is back in 2012, 2011. So, a few years ago we were working with clients and they were buying in. They were buying into content marketing. They were buying into social. They understood the value of providing that type of value to their customers. So, we would put together programs for them. We would help them with it, but at the end, execution was so difficult on such a regular basis. So, that really is where we started to say, "We need to help people execute." That's really where we started to develop CoSchedule. When that happened, we're just like any other startup. We went from this agency to like, "Okay, we're not going to take clients anymore because we really think we have something here with CoSchedule. We're going to launch this tool and we're going to go for it. We're going to go for it as a service company." So, we started out with nothing. We had maybe a few hundred email subscribers and some social followers here and there and a basic network from our agency, but we now needed to reach a worldwide audience. So, we then started to really experience this problem of how do you start with nothing and build that audience, build the trust in your brand and start to build that momentum over time. We're a tool that's helping people with social and content marketing. We need to use those tactics. So, we really dug in and forced ourselves to learn it. I think the thing that really became clear in the last couple of years as I write in the book was I go to conferences. I would … so on the phone with different marketers and just kind of sharing tips and see what they're doing. One thing I started to learn is even though we solve a lot of the technical problems, not all of them but there's plenty more to go, but we started to solve those types of things. The core problem that is starting to exist is that we bought into content marketing still. We bought into social. We're doing it. Many businesses are doing it and almost every business is doing it to a certain degree, but the results aren't always there. There were kind of hitting what gardeners five step hype cycle would call the trough of disillusionment. So, it's sort of like now we're all looking back and saying, "Okay, we've done this. We've been doing it. Where's the numbers? Where are the results? Where's the business value that we were promised and we've got to figure out how to make sure we get that they're just part of our program or else we're not going to be able to continue doing this." So, I just feel like content marketing is at that breaking point. We have to figure out how to provide business value every single day or it's not going to be able to continue in the same way. Randy Frisch: Garrett, I love the way you frame that. If people haven't seen Gartner's hype cycle before, it's a great framework that often shows and it's … I know now you and both myself I live in this a lot because I love Gartner's thinking and frameworks for things. Sometimes when people hear that word, they think, "Oh it's as though content marketing is dead." It's not that it's content marketing is over, it's just we're in this almost reality check stage. If you follow the different stages, you started a higher point of peak of inflated expectations where we expected to this like solve cancer overnight. Now we're in this point where it's like, "Okay, well you actually have to put a little bit of work in to do it." What I love about the aspects you highlighted in the book is some of these ways that we can achieve the success that we thought we were going to get here, but you kind of admit that it's not as easy as just pumping out content. One of the terms that you had in here I think was something around competition free content. Is that the right term? Garrett Moon: That's exactly right. So, I think what I'm trying to look at there is … I think if you go back a few years and you really start to see as content marketing really started to take off, there was this sort of effect that if you showed up, if you're one of the only ones in your industry to show up and actually create value-based content and really to embrace that medium, you can make an impact. You can get some attention traffic pretty easily just by showing up. What we've seen over the last for years is everyone showed up. Everyone's for the most part is there. Your competitors are doing it. You're doing it. As marketers I think sometimes we forget that particularly in the content realm that our content is now in competition with everybody else's content. Our marketing, the material we're creating to market our business is actually competing with other marketing material, which is sort of this strange paradigm. We're used to thinking about our business competing but now actually like the actual things that we're doing on a day to day basis as a marketer are in competition. Randy Frisch: You're so right by the way. Sometimes I curse when I see our competitors do something and I'm like, "We should have done that." It's not even a feature to your point. It's just a really well executed campaign. Garrett Moon: Yeah, exactly. This is great piece of content that "Well we had all that data sitting here, why don’t we just package it up or whatever or ask that question." That's really the concept of competition free content came from. I go back to there's a great business strategy book, a lot of marketers probably have read it as well but is called Blue Ocean Strategy. It really just creates this great visual metaphor that I just love where it's talking about competition as in there's two oceans. There's the red ocean where it's bloody with competition. Everyone's fighting each other. They're all using the same tactics. They're all doing the same things and it's going to be very difficult for you to succeed and rise to the top in that ocean. Businesses that succeed have to find their blue ocean. They have to find clean, clear, wide open expanse, wide open water where they can grow. There's a lot of pieces to that as a business but in terms of content like bringing that over and reframing it as [inaudible 00:12:30] to think about, "How do we not just create content not how we just publish, but how do we create content that is literally competition free? How do we take that principle and find our big wide open expanse where our marketing can really stand out and really garner those results that we got into this for?" Anna Hrach: The thing that I loved too about how you explore a lot of those competition free content topics and some of the ways you give to help combat a lot of the rising competition is talking about finding your core content. I am such a huge fan of this part of the book. I'm not even going to lie. I was reading it and just throwing my hands up and praising this section because it is. It's something that in my career I've seen a lot of brands really struggle with. They go this path of creating parallel content but not core content. So, I would love if you could just give everybody listening a preview on core content because I don’t want to give all the good stuff away. Garrett Moon: Yeah, I think it's really looking at some of the traps to start with. You have to contrast it with some of the things you can fall into. The two clearest ones are the traffic trap and the promotional trap that I cover. The biggest one honestly I think is the traffic trap because what it means is that if you have a piece of content that is generating good traffic, it may be getting a lot of shares on social. It may be getting a lot of comments or discussion. It's really easy in many cases to see that as a successful activity, because there's a lot of numbers that tell you you have a success. It's got more shares than any other post you have ever had. This got more comments than any post you've ever had. This is generating a ton of traffic. Google Analytics says this is great. The reality is that it's sort of this false positive in many ways. Really when you're talking about competition free content, we kind of learning that traffic isn't all that hard to get. You can get traffic even in today's age. So, you really have to start thinking about what you're saying and the content core is sort of a way to start framing the type of content you're publishing and refocusing it on what really provides business value. That's where we get to this point with content marketing. It's like, "Hey, we’re doing it. We're getting the traffic. We're getting attention, but it's not really bringing our business the value it needs." I think that's where you have to start turning towards content core and really finding a better way to do it. The content core is really simple and follows a pattern I do in the book where I try to develop really simple frameworks that you can use and that as you're creating content, as you're doing your editorial planning, you can just harken back on them. The content core just takes two ideas and it's just this really simple diagram of saying, "If you overlay two things, the first one is the topic, the top that your audience cares about." Something that they want to read about or are actively looking for and match it to content that equals the value or is it equal to the value that your business provides and you layer those things together so you're matching what your audience cares about to the value you provide as a business. Those are the two things that you need to meet up and that becomes your content core. So, the difference there is this … I go to extreme examples but like this list post that top 20 predictions for 2018. We had a post like that even on our blog. Those types of … or list posts are really good examples of this. They can get lots of attention, lots of traffic. They're easy to digest, but if they're not in line with your content core, if they're not actually aligned with the value that you're providing as a business, that they're going to fall short in terms of generating business results. So, at CoSchedule [inaudible 00:16:09] good examples as we launched a feature called marketing projects. It was basically a way for teams to manage entire marketing campaigns. So, not just a single blog post or a social campaign, but all the pieces of marketing process. The planning and the guest posts, you might be doing even traditional media and traditional content could all be done in this one marketing project. So, for that content core, the business value that we provided was we help you organize and optimize your campaigns. We help organize the creation and execution of those campaigns. The problem obviously is that it's hard to keep those things organized. So, what do people do? What are the solutions that people start to look for? They're looking for content, campaign planning worksheets and templates and things like that. Once you start going down that line, you start to see the connection here. There's people actively looking for this solution. This is actually a solution our product solves. So, let's create content that solves that exact same problem. So, we did … and that doesn't mean we wrote a blog post that said, "Hey, you have this problem, just buy CoSchedule. It's as simple as that." We actually provided a series worksheets and downloads and a total … 3,000 were blog post on how to solve that problem even without our tool. Sure, our tool does it as well, but it allows us to really connect on a value level with the people that experiences the same problems that our business solves. Randy Frisch: I love that way that you brought your own practices into this book as best practices Garrett. I want to dig a little deeper into how your team figured out what that core content is in your organization. 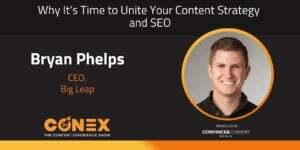 We're going to do that right after we hear from some of our sponsors here on Conex: The Content Experience Show. Right back with Garrett Moon. 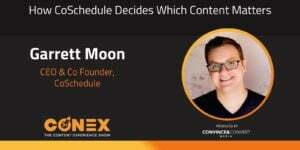 We are back here on Conex: The Content Experience Show with Garrett Moon from CoSchedule. We're talking all about his book 10x Marketing. Anna and I both love this idea of core content. I'm wondering if you can share with us how that content gets chosen within your organization, because it's one thing to have a framework I find but sometimes everyone in the org has different priorities for what content they want. The content team is always sitting there and they've got product marketing coming to them. They've got demand gen coming to them. This core content, is that the intersect? Is it fair to say that that's the content that everyone wants? Garrett Moon: I think it's a great actually a way to look at it. One of things that we've done is actually started doing … having our marketing team doing interviews with current customers. So, it's really common obviously in any organization for sales, our customer support or success to interface with customers and they just pass details off to marketers. One of the things that became interesting was when marketers were just starting … one of the ways we did this is actually just inviting our customers onto our podcast and just including some these questions. That intersect came by some of the questions we would look at is like just asking them about "What prompted you to start looking for a solution like CoSchedule? Like actually looking for our product. What were some of the problems you're looking to solve and why did you choose us? 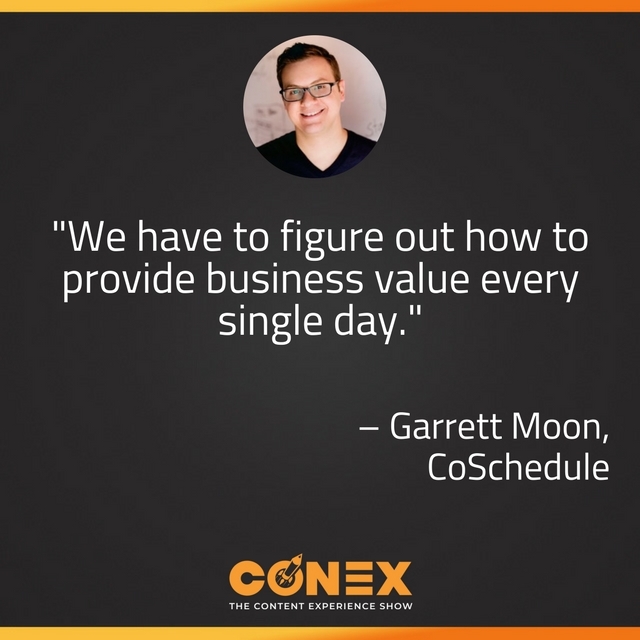 What was the most significant difference between us or what's the most significant difference at CoSchedule is making in your business today?" Inside of that conversation it's not like … they're not writing your content core for you, but they're giving you all the hints. Everything is kind of in those answers, because then you're really starting to understand not the value that you believe that you provide as a business but the value that your customers are receiving from your business and they're giving it to you. Boy, it's gold in there. You start writing down some of those phrases word for word. You got keywords for life much of the time. You can also do it through just looking at … doing basically Google searches on certain problems. I love to scroll down to the comment section and just see how people are really saying things versus what the blog post says. Like, how is the audience talking about it? LinkedIn groups can be great for that. What words are people saying to describe the problems that you're solving? Then, now you have really basically key phrases that you can create content around. Anna Hrach: It's actually really interesting … it always shocks me when I talk to brands who have not had a conversation with their audiences. You actually had an entire section of 10x dedicated to. It was really, really great. Very, very helpful questions and agree even just mining firm for data like onsite search. Even people forgetful to look there where people are literally putting in their own phrase what they're looking for from you. Do you have a preferred or favorite method of conducting interviews? Obviously, there is everything from video chat to phone call to in person. What's you preferred method? Garrett Moon: We're located in North Dakota. So, like a fraction of a percentage of our customer base is in North Dakota. So, in person is just not very much an option for us. If you're in the Valley or larger metropolitan area, it might be. So, we've always just relied on video chat. We always try to have that video connection if we can. I've always felt it can be very effective. The method isn't as important as just the activity of doing it. Just the activity of doing any way you can do it, no matter how simple it is, if it's just a phone … pick up a phone and you call him. If you're not doing that as a business, anyhow you get the information is going to make a massive difference. The method is less important as just making sure it happens. Anna Hrach: So, you also at the beginning of the podcast had talked about one of the biggest observations you found was that there were a lot of what you had witnessed as downfalls with the execution piece. You do as you mentioned give a ton of resources to execute. What would be sort of … if you could give like a top tip or a top two tips or three tips for people who are trying to execute where you see some of that fall apart a bit from strategy to execution, what would those tips be? Garrett Moon: I think one is making sure you're picking the right projects to focus on. I think most teams in terms of process and all those things have a good enough process to where they can really be effective. It's just a matter of making sure you're working on the right things. I think that's like the biggest danger is I think as marketers and I think as … there's more softwares. There's more tools. There's more things to measure. There's a lot of like small things that can kill us. In the book I talk about it and that's where what the 10x concept comes from, 10x projects versus 10% time or 10% projects. So, I talk about a whole method for really identifying like what are the projects or what the things that you can focus on that you can execute that have the potential to multiply your results by 10 times. Like to really make a massive difference on the results that you're getting within your marketing program versus all the things that you're doing on a day to day basis that really fall into that 10% time and eat up your day, eat up some of that time and prevent you from working on bigger projects. I think as a team if you can really work to build that 10x mentality like this is a 10x opportunity and just asking yourself that all the time and evaluating your editorial calendar, evaluating your daily schedule, your production schedule, all that, you can really improve your execution just because you know you're focusing on the right things. It was kind of the strange thing that happens. Once you know you're focusing on the right stuff, all of a sudden you could just magically execute it faster. You get a little bit more passionate, a little bit more exciting, a little more adrenaline maybe behind it and things can go very smoothly. Anna Hrach: Did you find it hard at first to start ignoring the shiny distractions to lead to that 10x mentality? Anna Hrach: Because it is a process, right? It's hard when there's just stuff coming at you all the time and everything. It seems like especially everything nowadays seems like a priority. To your point, there's difference between 10x and 10%. Garrett Moon: Yeah. I think there's two things I can think about on that in terms of experience of our team. One was I remember a long time ago, a few years ago, we really identified video as video is really coming. It's going to be a big difference maker. It's a 10x opportunity for us. We sort of asking ourselves some questions about that though. So, we just said … and the key one was, "Is this something our team can really do well?" When you look around, we're a small startup. We have very limited resources. There's [inaudible 00:24:45] 10 of us on this team. So, to really create the video content that we felt was going to make the difference on a consistent basis, we just didn't have the resources. It wasn't something that we could do well. What we could do really well was written content. We had everything we needed to absolutely nail written content and [inaudible 00:25:04] growth we needed from it. So, it was just one of those things where you just have to be honest with yourself. If you're not asking yourself that question, "Is this a 10x opportunity and can I do it well?" You miss that opportunity. Another strategy I use in that is just kind of outlawing so to speak some of the simple stuff. A good one is and I'll get some tweets on this I know, but as we just said as a matter of rule, if there is a spelling error or a grammar mistake on a blog post, we're not going to fix it. When our audience notifies us in the comments, when they tweet us, when they write into our support line and tells us about that mistake, we're just not going to do it. We're just going to say thank you and we're going to move on. I get a lot of flak for that. People say, "You're not putting your best foot forward. That's a damage to your brand." The bigger damage to our brand really was just the mental idea of saying like, "These things that don't really make a big impact, we got to put them aside and we've got to focus on other things." So, as a mechanism for our tool, it was far more important. I don't really have a problem with fixing grammar mistakes. It's just it can help you lose … it can cause you to lose focus. Randy Frisch: Now that you've got a book out there, I hope you did some proofreading on that book because that thing is going to be out there. People are going to be loving and that I know I personally think it's definitely going to be a 10x project for you, hopefully 20x in terms of what you took on with this. People can go and find that book if they're curious by going to coschedule.com/10 the number X book. You can also go I believe to Amazon and preorder it, although by the time this podcast comes out, it's going to be your launch week. So, an early congratulations to you on this. If you got a couple more minutes Garrett, we'll keep you around. We always like to get to know our guests a little bit more. Those listening in, you want to get to know Garrett, stick around. All right Garrett, so we've got you here for just a couple more minutes. We always like to ensure that our guest get to know the person behind the guy at work or gal at work. I did a little bit of digging on you and one of the things I found is other than our shared love of content and solving for marketers, Anna is in on that as well and I don’t know about Anna on this, but both you and I seem to have a love for winter and skiing. So, first of all, Anna I don’t see that. You've often talked up your trips with Jay and team to Mexico and things like that, but I've never heard you talk about snow skiing. Anna Hrach: No, and you won't. Randy Frisch: Okay. All right, fair. Anna Hrach: I fully support everybody's right to snow ski though. It just not for me. Randy Frisch: All right, fair enough. So, Garrett where is like your best skiing that you've done in the last two years? Garrett Moon: Every year my family, we make a trip out to Big Sky Montana which is right outside of Bozeman Big Sky Resort. We just absolutely would not miss it. It's a guaranteed lock on our calendar. Everyone on the team knows that Garrett is just going to be gone for a week in March and that's just the way it's going to be. So, Big Sky Montana. Putting the plug-in for the northern states. Randy Frisch: Guys, that's awesome. Last week actually I was in Utah skiing at Snowbird which was they got a little bit more snow but then I always remind myself that it's an actual mountain compared to where I live in Toronto, Ontario where a hill is a generous definition. So, what kind of skiing do you do? We just got over the Olympics for those who have been tuning in. They probably watch all that downhill, the freestyle. What's your style? Garrett Moon: Definitely not freestyle. I'm too old for that business, but I'm more of like a super G. That was always my favorite event in the Olympics growing up. I love the speed. Those nice icy days where you can really move are really fun, but powder is great too. I just love to ski. Just being in the mountains, fresh air, a cool crisp air can't go wrong. Well maybe you can for me. Randy Frisch: For Anna and I, this is just like the worst conversation ever. Anna, what is your downtime … or not even downtime because I think skiing for someone like Garrett and myself, it's that thrill. Anna Hrach: I am such … you know what? It's funny like anything in the sunshine. Give me sunshine all day every day. Everybody has heard me talk about being from Phoenix on this podcast before so me and now, it's just not natural, but I wish I could do it. Garrett, that sounds like an amazing vacation genuinely. I do have one actually final question. What was your like post ski drink at the lodge choice? Garrett Moon: Wow! This is going deep. This is a good question. So, the group we go with … we have some folks that come from the West Coast. There's always smoked salmon which I don't usually partake in. I'm more of the cold beer and pistachios is probably the go to. Garrett Moon: I think salty and some beer to go with it. Randy Frisch: You got to go nachos and cheese, but like good quality nacho and cheese and I'm happy too. Anyways, Garrett. it's been awesome again to know you on the podcast, having you here to hang out and really encourage again people to check out the 10x book. Some great learnings, great framework to up your game and how you deliver the content, what that experience is that people are getting when they consume it. On behalf of Anna Hrach at Convince and Convert, I'm Randy Frisch from Uberflip. 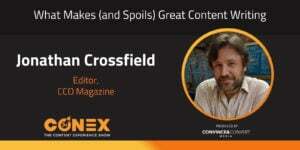 This has been Conex: The Content Experience Show. You can find all of our other podcasts pretty much everywhere these days. iTunes, Stitcher, Google Play, Spotify, we're everywhere. Leave us a review. Let us know what we can do to make this more engaging. Until next time, thanks a ton to Garrett. This has been the Conex Show.